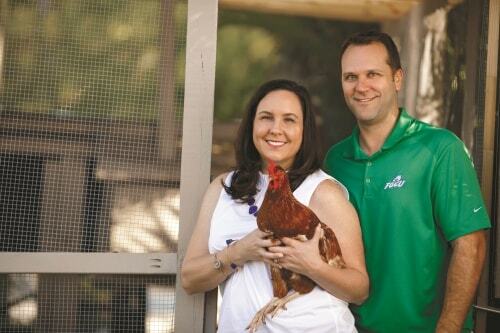 In Andy and Angela Kunkle’s world, the chickens most definitely came before the eggs. A dozen peeps, to be specific. They were given to the Kunkles as a gift from Angela’s dad at Easter time a year ago. But unlike the untold numbers of baby chicks in a box or a basket that have scratch chance of survival once the holiday novelty wears off, the Kunkles’ little Rhode Island Reds — all 12 of them, including a gravely sick chick that Andy had to nurse back to the brood by handfeeding it with a syringe — lived to become the gift that keeps on giving. That gift? Eggs. Usually one every day from each hen. All brown. All natural. All nutritious. Andy (’02, Computer Information Systems) and Angela (’04, Communication) are both Florida Gulf Coast University alums, with Angela still firmly entrenched in The Nest as University Advancement assistant director for major gifts. So for these two Eagles, married life, their two young children, a dog and a dozen hens in a backyard barnyard at their one-acre property just minutes from campus, is just about everything family happiness is cracked up to be. Indeed, the Kunkles have yet to see one of their chickens become dinner for the panthers, bobcats, bears and raccoons that have been spotted at various times in their neck of the woods. “We’ve been fortunate so far,” Andy said. “I chained the door to the coop open for them, and a big ficus tree — about 40 feet tall and six feet in diameter — got knocked down next to the coop from the 100-mile-per-hour winds. They came out and hid underneath that tree during the storm, because we found about 30 eggs they laid throughout the root system. For as silly and dumb as they look, they knew what to do,” Andy said. The chicks are fairly high-maintenance when they are young, which is why the Kunkles recommend starting out with just a few birds instead of the dozen they did. Temperature for the babies is critical, with warmth from a heat lamp and cool areas both needed inside the coop. Chicks also make bigger messes in their bedding and water, and Andy even had to clean and clip feathers on the butts of some so they didn’t get clogged. Now that the chickens are older, they only require about 15 to 20 minutes of care each day. Andy makes sure they get the best natural feed — he grows his own rye grass, and they also eat barley and “all of our table scraps. Everything we feed them is non-GMO, organic and as natural as possible,” he said. It costs about $20 to feed the flock for a month. So, here’s the scoop if you want your own coop, assuming first your residence is zoned for agricultural uses (check with local code enforcement): When you tally the cost of the chicks (they usually range from $1 to $5 each, with females more expensive), starter and permanent caging, food and incidental expenses, it’ll cost you roughly $1,000 or so to crack into this hobby. The rewards from that investment? Then there’s the sunny side of being henpecked. “If I ever have a bad day, all I need to do is go home and watch those chickens for five minutes, and I don’t have a bad day anymore,” he said. And of course, there are those gifts from the gifts that keep on giving: the eggs themselves, all with brown shells (that’s what Rhode Island Reds lay) and yolks with an orange tint, which comes from the nutritious diet the flock is fed. 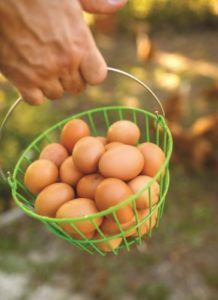 If the eggs aren’t washed and retain the protective coating on the shells — called egg bloom — these Kunkle Rhode Island Red eggs stay fresh indefinitely without refrigeration. Most proceeds from the informal family egg sales go to good causes that are tough to beat. While a fraction goes toward feed expenses and the Kunkle Family Scholarship Endowed Fund in Honor of Jay Kunkle — awarded to FGCU science students in tribute to the man who first got his son Andy started in backyard sustainability — most goes into college savings accounts for the Kunkles’ children: Alexandra, 4; and Aiden, 1. That’s what you call real nest eggs, funded by 12 little chickens raised and tended by birds of a different feather: a couple of FGCU Eagles.